Below are reports from 2006 for rally teams sponsored by Luke Furse Earthmoving Ltd.
Young driver Lloyd Furse and co-driver Rob Short showed that they are definitely a crew to watch for the future, when they finished sixth overall and third in class at the recent Tempest Clubmans Rally in Hampshire. Driving their self-prepared Subaru Impreza against a high-class field that included several ex-World Rally Championship cars, Lloyd and Rob set a blistering pace throughout the day to finish four minutes behind the runaway winners, Michael O'Brien/Matthew Pearce in another Subaru Impreza, after 45 miles of fast, rough forest stages around Aldershot. The Tempest Clubmans Rally was the final round of the national 'Stars of the Future' championship. Although they were not registered for the series, it gave Lloyd and Rob the chance to compete directly against some of Britain's up and coming drivers. Despite it only being their fifth event together, the youngsters settled straight into a competitive pace, setting consistent times inside the top five, and battling with the vastly experienced Stuart Larbey in his Metro 6R4. Lloyd and Rob continued to put pressure on the leaders by concentrating on fast but tidy driving over the increasingly rutted surface. They suffered a minor time loss through the shortest stage of the day in Rushmoor Arena but immediately fought back, taking 45 seconds out of Larbey over the last two stages, held in the dark, finishing eight seconds short of fifth place overall. Speaking after the rally, Lloyd said: "That was a tough event – we have never rallied in these forests before, and there was a very high level of competition. We simply concentrated on staying mistake-free and it worked. We are learning more with every rally we do, and the main thing is, we're enjoying it." 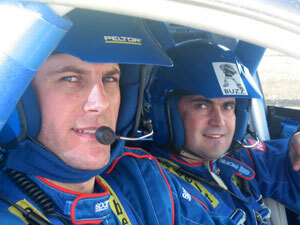 Lloyd and Rob's next event will be closer to home at the Tricky Stages Rally in Somerset. There was more local success on the recent Tempest Rally, when Launceston-based rally driver Richard Fishleigh and co-driver Tim Young finished a well-deserved second overall after a day-long three-way scrap with national championship regulars Phil Newson/Steve Greenhill in a Mitsubishi Lancer Evo 8, and Graham Roberts/Alan Lock in a Subaru Impreza. Richard took the fight to his rivals right from the 'off', using the superb power and grip of his Subaru Impreza STi to jump into third spot. Overcoming a minor fuel problem on stage four, Richard moved up to second overall with consistent driving in the middle of the day. It soon became clear that whereas Newson was faster through the shorter stages, Richard and Tim were quicker on the longer runs. Consequently, the two crews stayed neck and neck throughout the afternoon, but the issue was sealed in Richard and Tim's favour when they stopped the clocks an incredible 40 seconds faster than Newson through the penultimate stage, Warren, setting the fastest overall time of the day for that stage in the process. "I competed on last year's Tempest Rally, and I've got a good memory for stages, which stood us in good stead today. We'd been through Warren in the morning and we'd been quicker than Phil then, so I had the confidence to push the car as hard as it would go on the second run. Setting fastest stage time overall was a real bonus" said Richard at the finish. Despite the rough stage conditions, Richard's car finished with no major damage. Even so, it will still receive a thorough overhaul before Richard and Tim head off to their next event, the Tricky Stages Rally in Somerset. A first visit to the aptly-named Tricky Stages Rally in Somerset paid dividends for driver Lloyd Furse and co-driver Rob Short, as they battled their way to fifth overall against a high-class entry that included former national rally champion Marcus Dodd in his Hyundai Accent WRC. Making light of the notorious tyre-shredding concrete surface at Tricky Warren airfield, Lloyd and Rob were soon challenging Graham Roberts/Scott Cleverdon for fifth place. The two Subaru Impreza crews swapped stage times throughout the morning, and the closeness of competition showed as Lloyd needed new tyres after only four stages. "Unfortunately, the on-site tyre van had already sold out because so many teams had punctured. We had to refit our old tyres and carry on" he reported. Despite running on worn rubber, Lloyd and Rob chased Roberts hard, and the pressure told when Roberts went too fast into a corner and hit a gatepost. Lloyd, immediately behind, sportingly reversed to let his rival pull back from the post, before continuing the battle. The last two stages ran in the dark, and with increasing confidence, Lloyd and Rob set third fastest time on the final stage, just four seconds adrift of Dodd. This clinched fifth overall, and left the Devon pairing only 1/10th second behind fourth. At the finish, Lloyd was quick to praise his co-driver: "Rob was using stage diagrams instead of pace notes for the first time today, but he called the bends superbly and kept me on the pace. We thoroughly enjoyed the battle with Graham Roberts – he made us work hard, but luckily, we were faster in the dark. Rob and I have had an excellent first season together and we're already looking forward to 2007." 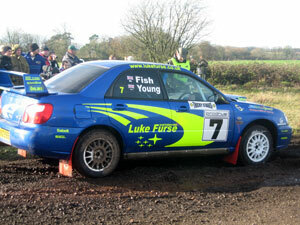 The pairing's next outing will be at the Wyedean Forest Rally in February. Launceston rally driver Richard Fishleigh and co-driver Tim Young put in a strong performance at the recent Tricky Stages in Somerset, fighting back from a time-consuming fourth-stage puncture to finish 11th overall after eight fast and furious stages at Tricky Warren airfield. 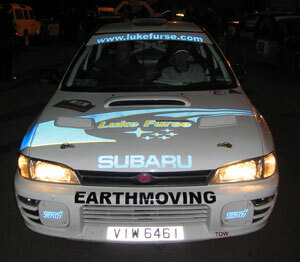 Richard and Tim started in storming fashion, hard-charging their Luke Furse Earthmoving-supported Subaru Impreza straight into fifth overall, which they fought hard to retain against strong opposition including former national rally champion Marcus Dodd in a Hyundai Accent World Rally Car, and Martyn England in his Mitsubishi Lancer Evo 8. Fourth overall fastest times on the next two stages put pressure on the crews immediately above them on the leaderboard, and they looked odds-on to move up. But it all went wrong for Richard and Tim on the fourth stage, when their tyre deflated as fast as their hopes of a high-placed finish. Undeterred by the setback, they literally lit up the tarmac with a series of ever-faster times, which culminated in second fastest on the day's final run, just two seconds shy of being quickest overall. "It's so disappointing to have lost so much time with the puncture, as we were flying on the other stages" said Richard. "The car ran really well today. It's set up for a combination of speed and reliability, but you can't always take into account how rough the stages will be. A lot of crews suffered punctures out there today, and we just happened to be one of them. We will give the car a thorough overhaul during the winter, and be out chasing the top places again next season."